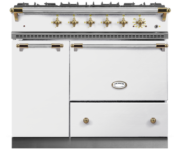 Combining the subtle and sophisticated, the Cormatin Range offers extraordinary possibility in a sleek and streamlined design, measuring in at a handsome 27 9/16” width. 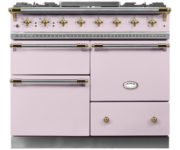 Choose from one large Gas or Electric Convection Oven, with one of three distinct cooktops to suit your culinary style. 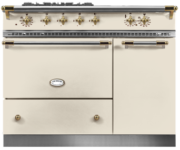 Click the button below to configure a Cormatin moderne that is perfect for your kitchen. 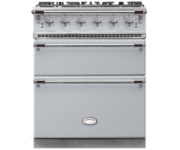 The Classique 4 Feux features 4 burners: (2) 11,000 BTU burners, (1) 15,000 BTU burner, and (1) 5,000 BTU buner. 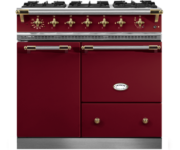 The Classique 4 Feux option is fantastic for those seeking a bit more flexibility on the cooktop, especially on smaller ranges. A good mix of everyday burners, and you will be set! 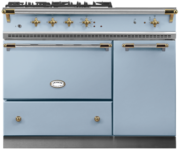 What is the interior size of the oven? 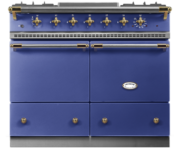 21″w x 12″h x 18″d (keep in mind the electric oven will have a depth of 16″, as there will be a convection fan in the back). 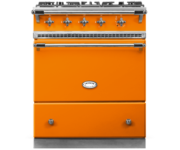 Are the ovens gas, electric or electric convection? Your choice! 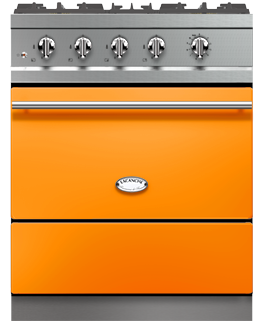 You may choose whether you would like to make this one large gas oven or electric oven with convection. Yes! 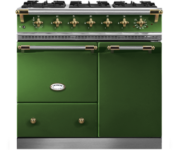 If you choose to get an electric oven on the Cormatin model it will come with a toggle switch that allows you to convert to convection. 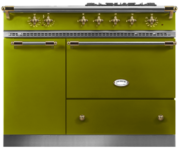 We currently offer 24 premium color finishes, including stainless steel. Matte Black is our standard finish. 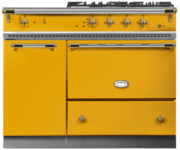 All other color finishes, including stainless steel, are considered to be premium color finish upgrades. Please see prices for color upgrade charges on each respective product page. Solid Brass is our standard trim. No additional upgrade charge for this trim. Brass will be on the rail ends of the towel bar, oven and burner knobs, and drawer pulls. The towel bar itself will always be brushed stainless steel. Lead time for the arrival of your range is dependent on several factors: the size/model of the range you order, upgrading to a premium color finish, and then of course whether or not you choose air or ocean freight. As approximate timelines, delivery will take about 3 months by air, or about 5 months by boat, from the time you place your order to arrival at your house. I have a very simple, white classic kitchen. 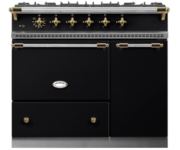 My 27.5" adorable black enamel Lacanche range makes the space unique and memorable. I feel very chic and a little smug. THANK YOU Lacanche for the breath of fabulous! View more detailed specifications here. A. For the Cormatin model, choose an overhead canopy with the following optimum specifications: 30″ wide (36″ for island applications) x 24-27″deep. B. Blowers should be rated at 300-550 cfm, with 6-8″ round ducting, or equivalent. Size should be measured by the style and quantity of cooking, i.e. Asian stir-fry (vaporized grease) requires higher performance blowers than French reduction (steam).